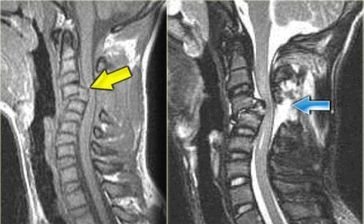 An atlantoaxial dislocation is a dislocation of C 1 & C 2 Verterbra leading to instability & compression of high Cervical Spinal Cord. An atlantoaxial dislocation is also associated with a fracture of the odontoid process, in such a way that the end which forms a joint with the atlas is separated from its base and kept in position only by the ligaments, which are not strong, joining it to the atlas. An atlantoaxial dislocation is a result of significant trauma, congenital, Rheumatoid Arthritis and also due to infection like tuberculosis. In cases of atlantoaxial dislocation, medical history and physical examination provide very vague information and are not sufficient to arrive at a diagnosis. If the existence of an odontoid fracture and an atlantoaxial dislocation are suspected, physical examination must be performed with great care to avoid movement of the neck. It involves the Anterior Transoral Exesion or fixation of odontoid process & Posterior Oceipito cervical fusion using instruments.